*Seven Sea Pregnancy 28 tabs *Rude Health Multigrain Crackers *Palmer's Cocoa Butter Formula massage cream for stretch marks *Dove Hair Oil *Pregnancy: The Beginner's Guide -ThanksMam Pregnancy Essentials Subscription & Gift Box is the box we recommend for mums-to-be buying for themselves to get their monthly essantial needs ready to their door step. It has all the high quality essentials pick by our experts. 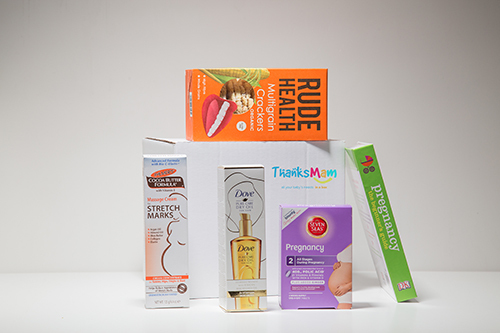 Each monthly box includes WHY you need these products and improves each trimesters of pregnancy. Many mums who receive one go on to buy it for expectant friends, which is the best review we could ask for.